Easy to use, simply plug and light! Will work with any Light ballast. 12′ 15′ 19′ Hanging Lamp Cord is individually inspected for quality and for safety. E26 Hanging Lamp Cord. 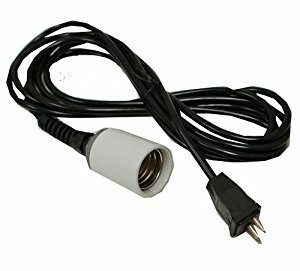 The Hanging Lamp Cord has an on/off switch and a standard polarized plug for US and Canadian electric systems. Comes with hanging hardware. Our Hanging Lamp Cord kits will work with most paper lanterns and nylon lanterns. Many customers use our lantern cord kits for infinity lights.